Although relatively thickly cut, they were thin enough to provide a crispy snappy crunch. This deteriorated around the halfway stage of the munch process as mushiness took hold. These were reasonably thickly cut Crisps that were small to medium in size. There was a nice outer edge of potato skin on many of the Crisps and they were bent, curled and folded into all sorts of characterful shapes. There did not appear to be many oil boils, but the coating was a gentle but sporadic orange colour. 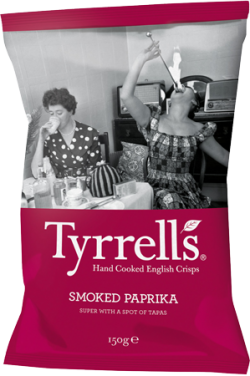 There was not much of an aroma to these Crisps, which was a little surprising, most Paprika flavoured Crisps have some sort of peppery smell about them. The taste featured an especially greasy backdrop. The Paprika was very mild. And to be honest, we were a little taken aback by the mention of a "Spot of Tapas". Whatever does that mean? Tapas is of course a range different dishes - perhaps they mean Potato!